I am no expert since over the last two days we have had plenty of tears, falls and at times crabby kids. BUT myself and several other moms have certainly learned some valuable lessons about how to keep littles ones happy while at the same time trying to make money by selling your stuff at a garage sale. So I am passing along our wisdom! Keep them outside because it wears them out and leads to excellent naps! While a movie or tv shows might keep them happy for a while indoors it will also not use up much energy. And you won't have eyes on them while you are outside at the garage sale. Outdoor play is your best option! Bubbles. Don't stress over the spills. Give each child their own bottle. Have back up bottles in case someone drops or spills immediately. Challenge them to see who can blow the biggest bubble, get their bubble to float the longest, blow a bubble while running, blow a bubble while spinning, etc. Sidewalk chalk. Tell the kids you need their help to attract customers. Have them draw bright colorful pictures along the sidewalk and driveway. Games like hopscotch, drawing the whole alphabet or tic-tac-toe can also be great ideas. Yard games. If your garage sale is mostly in the garage and driveway then hopefully you have some grassy area for the kids to play games like ladderball, washers, horseshoes, etc. Plastic kid versions of these games are commonly available at many stores for smaller kids too. Lemonade Stand/Bake Sale. Let your kids take part in the selling of stuff and have them make a little money of their own. They can decorate a cash box, decorate the sign, learn how to run the stand and then be the seller at the stand taking care of customers. Let them play with the toys that you are selling. Some people might disagree with this but old toys that your kids don't play with anymore may have new appeal when they are brought outside and suddenly up for grabs by other people. But be sure to tell them that even though they are playing with them right now they will still go home to somebody else's house today! We wanted to put up a sprinkler as well and I think water play could be a great way to keep them entertained but it was not warm enough for us to do that today. And it could be a pain if you don't have enough distance between the water and the merchandise. 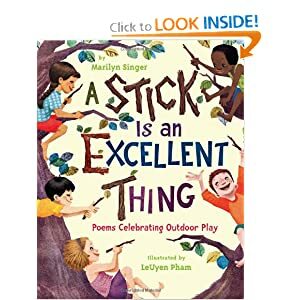 For some other great outdoor play ideas and some very cute poetry about outdoor play be sure to check out "A Stick is an Excellent Thing; Poems Celebrating Outdoor Play" by Marilyn Singer!